The Cleveland Police Department has turned over documents to the NFL related to former Browns safety Jabrill Peppers, his stolen gun and the homicide of a 57-year-old woman. 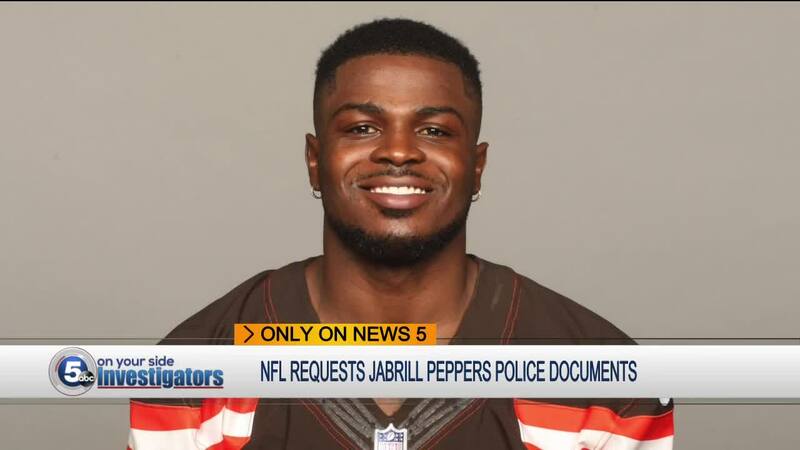 CLEVELAND — The Cleveland Police Department has turned over documents to the NFL related to former Browns safety Jabrill Peppers, his stolen gun and the homicide of a 57-year-old woman. Peppers is not a suspect in the homicide, police say. 5 On Your Side Investigators learned Tuesday that CPD turned over two different reports to the NFL last week. The first report is from Jan. 29 and is regarding an incident involving a stolen gun belonging to Peppers. The report states that someone went into a parking garage on East 12th Street, broke into Peppers’ 2014 Range Rover and took a bag with his jersey number on it, sunglasses and an iPad. The report also states that a Glock semi-automatic handgun was taken from the center console. According to the report, a 57-year-old woman named Marsha Carroll was listed as a possible suspect. Court records show Carroll had a long history of arrests, but the report doesn’t indicate she was ever arrested in connection with the stolen property. The second report the NFL requested was regarding Carroll’s homicide. On Feb. 6, Carroll was found beaten, taken to a nearby hospital and later died. A 26-year-old man named Deointa Campbell was arrested and charged with murder and felonious assault for Carroll’s death. Campbell told police the blood on his hands was from him biting himself, the report states. A Cleveland police spokesperson told 5 On Your Side investigators Tuesday that Peppers is not a suspect in any investigation, only a victim of theft. However, authorities did confirm an internal investigation is taking place regarding police handling of the theft incident. It’s not known what the NFL is specifically looking for in the documents it requested from Cleveland police. It’s also unclear why the league wants that information nearly two months after the crimes occurred. A league representative did not reply to News 5, and neither did the security representative who requested the police reports. A Browns spokesperson said he was not aware of the league's inquiry. Peppers was traded to the New York Giants earlier this month.